Across the street from the Original Pancake House on Portland Rd. 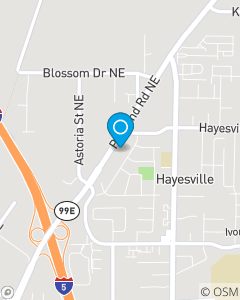 and Hayesville Dr.
Our office loves our customers, their insurance, and State Farm. As residents of the Salem/Keizer area, we are committed to providing you with personalized assistance in a caring and simple manner. From renters and home insurance to condo and car insurance we are here 24/7. Call, click, or walk in to our office located on Portland Road, just North of Interstate 5. Stop by our office or call us for Good Neighbor Service!